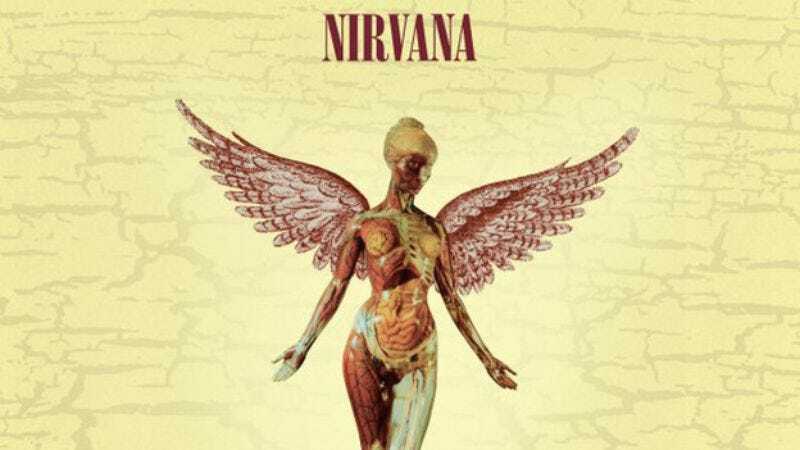 Nirvana's upcoming In Utero reissue to feature previously unreleased material and "2013 mixes"
The tracklist for the Nirvana's upcoming In Utero reissue has been released, and it looks pretty extensive. The 70-track-strong, 3-CD/1-DVD, “super deluxe edition” will include a remastered version of the original LP with mixes by Steve Albini, a new “2013 album mix” of the record (made by some as-yet-unknown entity who is hopefully not Just Blaze), some demos, and rehearsal recordings. The band’s 1993 “Live & Loud” concert for MTV is also included. But perhaps most intriguing are two previously unreleased tracks that sneak into the mix. One is a newly found instrumental rehearsal recording named “Forgotten Tune.” Another is Grohl’s 1990 demo of the B-side “Marigold,” which Rolling Stone calls “his first-ever solo recording”—though that kind of assigns a level of prominence to the track that it might not deserve. The reissue also includes a copy of Cobain’s handwritten lyrics, plus a four-page note Albini wrote to the band before recording. Bobcat Goldthwait, who toured with the band and coached it through birth, has also penned some new liner notes. The reissue will be available Sept. 24, and is available for pre-order now. 13. "School"14. "Come As You Are"